The City of San Diego is opening a new overnight parking lot for homeless people to sleep in their cars. They are also working on a new ordinance that would place new restrictions on living in vehicles. Matt Boone reports. SAN DIEGO (KGTV) - City leaders announced a new overnight parking lot on Tuesday for people living in their vehicles. It comes a day before the city committee on Safety and Livable Neighborhoods will vote on a new ordinance that would create restrictions on vehicle habitation. 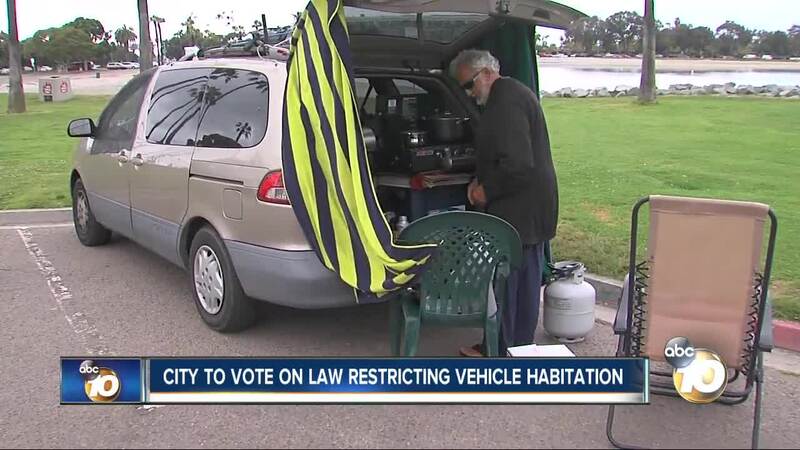 Living in a vehicle has been legal since a federal judge filed an injunction against the city’s law last August, saying it was too vague. The new ordinance would restrict living in vehicles within 500 feet of a school or residence at all hours of the day. It would also make it illegal to live in a vehicle from 6 pm to 6 am anywhere in the city, except in the approved lots. “The city cannot solve the problem, so their tactic is, “let’s hide it,’“ said Caesar, a man who lives in his van and wished to withhold his last name because he is currently looking for a job. He said he used to have a stable living situation but fell on hard times after paying for his two kids college tuition. Then he lost his job. Caesar said, he may end up using the new city parking lot in Mission Valley, but he worries that if the new ordinance passes, he still may be ticketed by police. “The tactic is, let’s load them with citations,” speculated Caesar.